East Sussex Fire & Rescue has been established since 1997 and provides prevention, protection and response services to over 800,000 people in East Sussex and the City of Brighton & Hove. 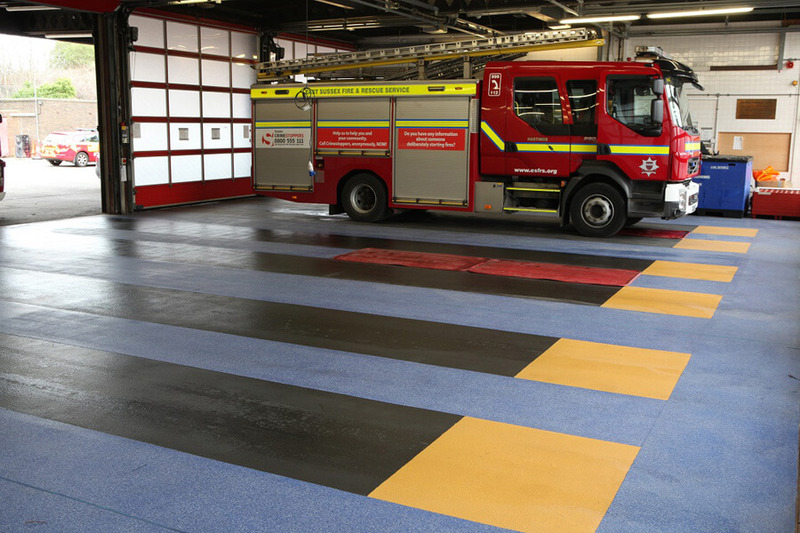 The Fire Authority manages 27 fire stations and has been updating their floors to maximise safety with the help of The National Flooring Company. The Fire Authority has been working with The National Flooring Company for the last 10 years to ensure their stations are compliant when it comes to Health and Safety by installing durable, slip resistant flooring in their appliance bays. A total of 13 stations have been completed to date. Most of the stations still had their original tiled flooring that were not providing adequate slip resistance in wet conditions. The Authority also had concerns over the durability of the tiles which were often breaking up due to the weight of the appliances, weighing on average between 12-13 tonnes. The Degafloor FB system, recommended and installed by The National Flooring Company, offers the ideal solution for appliance bays because it is highly durable and slip resistant, even when floors are regularly exposed to wet and oily liquids, and can be installed with minimum disruption and downtime. The Degafloor range of products are based on MMA resins which are thermoplastics and will achieve a chemical bond between each installation layer, resulting in a monolithic finish. Each new layer chemically fuses to the previous layer (or existing subfloor) creating a virtually unbreakable bond. This unique chemical bonding processes means that the resins can be applied directly onto the original tiles without having to remove them, providing they are securely fixed. This offers an exceptional time saving benefit for fire stations which only have small windows for refurbishment. For areas where tiles are broken and in need of repair The National Flooring Company can install a quick curing Degafloor repair mortar which again reduces time on refurbishment projects. The Fire Service had made it very clear from the start that time was an issue when undertaking any refurbishment projects as the appliances cannot be stored out of the bays overnight or for any long periods of time. All of the Degafloor products are fully cured within just 2 hours of installation allowing the fire engines to be stored back in the bays at the end of the day. The National Flooring Company has continued to develop their relationship with East Sussex Fire Authority and has recently completed two more station flooring refurbishments at Battle and Hastings.